You know what's more fun than watching Oliver Queen train a bunch of new recruits in the lair? Imagining the entire thing as if it was "I'll Make A Man Out of You" from Mulan. Stick with me here for a moment, won't you? The whole premise of that song was that Li Shang was training ill-equipped soldiers to prepare for battle. Mulan is essentially told that she doesn't have what it takes to fight, and is sent home. But she returns, because the ferocity of sheer will is an incredible thing. And she proves that she deserves to stay. One of the most interesting things about Arrow is that this year is a resetting of sorts, but with the "reset" button flipped on its head a bit. When the show first started, Oliver was on a one-man mission of darkness, fueled by avenging his father and his father's list. The Vigilante — as he was called then — was all about doing things alone because felt like he could not let anyone close to him again. (Flash forward a few years and you've got Oliver Queen on a one-man mission in the streets, doing things alone because people have left him and he doesn't feel like he needs anyone.) 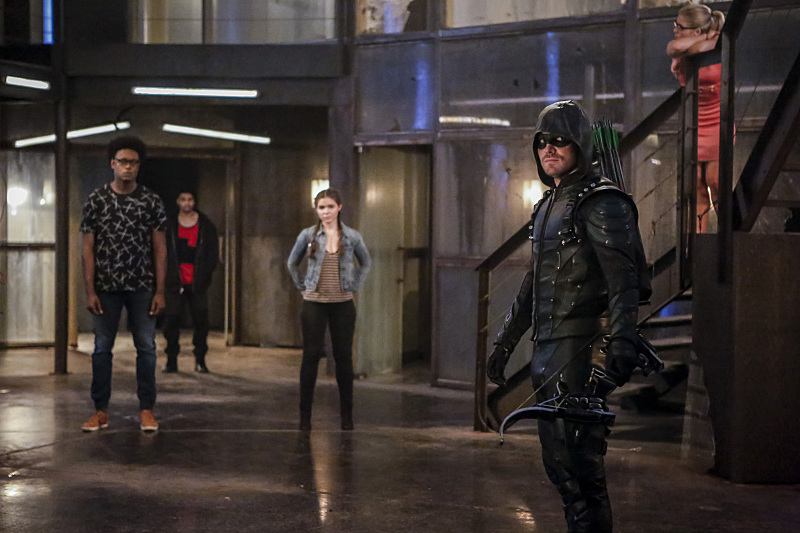 As the series progressed, Oliver allowed a team of people to surround him and fight with him: Diggle, Roy, Felicity, Thea, Sara, and Laurel. The team when at its strongest was filled with trained fighters. Sara learned from the League of Assassins, Roy from the streets, and Diggle from the battlefield. (Flash forward a few years and you've got Oliver Queen's new team of heroes, all totally untrained and unqualified to roam the streets, enacting justice). It's important to recognize these parallels because I think it's no accident that they are parallels. Oliver is straying fairly close to the same kind of trajectory that got him into the League of Assassins a few years ago, and drove him away from love and happiness. Oliver is starting to change in the same way he did years ago (by not being alone and allowing others into his life and team), but the true test of character growth will be how he handles loss and struggles within this team. Team Arrow 6.0 (or whatever I named it last week) HAS to be different than the other teams that came before it. Oliver has to choose to invest in these people like he did so deeply with Roy. And he has to train harder than ever before. But most importantly of all, Oliver has to be a beacon of light for these people. Older versions of Team Arrow were OLIVER'S beacons — Diggle and Felicity were the first two who brought him back from the brink several times; Roy gave him someone to mentor and opening up the lair to Sara and Laurel and Thea meant that Oliver had to change his ways and methods. "The Recruits" reintroduces "teacher" Oliver to us, and the result is a pretty solid episode that makes some really important points regarding teamwork and trust (and also gives a well deserve verbal smackdown to our hero). Normally, I love making fun of Oliver Queen's teaching skills, like I did in the opening of this episode review. And for the first few minutes of training, Oliver's tactics are amusing (in spite of the fact that he didn't even choose to give them mats to fall on. WHAT KIND OF TEACHER ARE YOU?!). But the longer the episode wears on, the less and less amusing Oliver becomes. And the more scary he actually grows. Because the truth is that this is the first real team that Oliver has had to train since the induction of Roy. And it's not that he doesn't know how to train them like an actual human being would — it's that he refuses to, because training them as Oliver means that it will hurt more when they all leave or die. Felicity urges Oliver to treat the recruits like people, and to allow them to see the reasons for his methods rather than just to force them to blindly accept his extremely aggressive (and emotionally abusive) teaching. If you ever learn anything about leadership — be it training or classes or just reading this review — you'll learn that leaders aren't the people who yell the loudest or who bark orders; leaders inspire you and encourage you and challenge you. But most of all, they give you reasons to trust them. Some of the best leaders I've ever known have been those who have challenged me to walk alongside them and have given me grace. Oliver doesn't want to do that though. He wants a dictatorship, and he always has. That was the biggest problem when he "died" on top of that mountain and came back to a fully-functioning team. Oliver attempted to bark orders and call the shots, but a team doesn't function without trust and respect. And the new recruits don't respect Oliver because they don't, as Felicity pointed out, know him. At work recently, we discussed this: trust among leadership being a crucial aspect of a successful and healthy work environment. Trust and communication go hand in hand. The reason that Felicity fell in love with Oliver and the reason that Diggle and Thea and Sara and Laurel and Roy walked into battle — and certain death — for him was because they knew him as Oliver Queen and The Arrow. They trusted him: his character, his motives, and that he would always have their backs. And in skipping the crucial step of trust, Oliver is repeating the same habits that drove a wedge between him and Felicity last season and regressed his character so far into the ground that he was almost recognizable. You cannot go into battle, as Wild Dog noted, with someone you don't trust. But how do you establish trust among strangers? And who is responsible for it? It is not, as Curtis venomously corrects, the fault of the new recruits that they don't trust Oliver. It's HIS problem and HIS fault, and HE has to deal with it. No one else. I got flashbacks to season four in this episode, and it made me so happy because finally the writers are acknowledging Oliver's problematic blame-shifting and setting him on the correct course. It's so important that Arrow is laying the groundwork in the second episode of trust, not just for the new recruits but for the theme of the season — legacy. These small building blocks that the writers are constructing will be important in anchoring that theme and important in reconstructing Oliver Queen as a character. Felicity points out in the episode that the reason the team trusted him was because they knew him. They didn't go into battle for a faceless, angry vigilante. No one in their right mind would do that because that's not a leader; that's a bully. No, leaders are the ones who march into battle and tell you that they will be right beside you. They're the ones who open up to you, who trust you to care about them and protect them, and then who turn around and trust the crap out of you right back. Oliver needs to learn how to be vulnerable again. He's back in the same spot he was a few years ago — team-less, trying to stop doing things alone — but he needs to be a better version of himself than he was years ago. That starts with acknowledging that he has issues and needs to remedy them. That starts with allowing people into his life (like Curtis and Felicity) who are unafraid to tell him when he's being harmful and unbearable. That starts with Oliver not letting himself be alone, even if it is — in a lot of ways — easier. 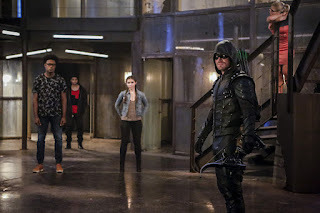 And at the end of the episode, Oliver finally takes Curtis' smackdown (which was glorious and delivered with utter perfection by Echo Kellum) and Felicity's two (yes, she needed TWO) speeches to heart; the team returns to the lair, and Oliver reveals his identity to the new recruits. It's a start — Oliver being his most vulnerable self; his truest self. And it shows the new recruits that this guy who is yelling at them and pushing them around actually WANTS them and needs them on his side. If Oliver can continue to learn how to be trustworthy and to leave that legacy, I might just learn to trust him too this season. Even though it hurts me, Quentin Lance's storyline is a really important one this season. Addiction is not a cut-and-dry process. You aren't just immediately cured of your want for alcohol, and I love that the most important part of this story for Quentin is that someone is there who won't give up on him. Laurel was Quentin's rock, and when she died, his whole world fell apart. It's understandable that he's having a difficult time adjusting and even more understandable that he feels like everyone will just see him as a drunk who doesn't deserve a job or responsibility. After all, because Quentin is drunk in this episode, he lets Ragman attack someone and then escape. But Thea doesn't see Quentin as useless or a drunk. She looks past his pain and sees the man, not the addiction that is holding him captive. Because that's what addiction really is, at its core — shackles around our ankles and wrists that tie us down and force us to obey. She deeply cares about him and offers him a job, not out of pity or obligation, but because she knows that there is more Quentin has to offer the city and the people around him than just the portrait that addiction would have him believe. And Quentin leaves not feeling guilty for his mistakes or angry, but humbled and hopeful. I don't know if anyone has had a better character arc than Thea Queen. And when Quentin quips in this episode that the wrong Queen became mayor, I cannot help but agree. Thea is not only qualified for the job, but she's also passionate — filling in during Oliver's noticeable absences while he moonlights as the vigilante (or... is it the other way around?...). But most importantly of all, Thea has found her own light and her purpose. She's channeled what she's good at (leading) and what she's passionate about (helping others) into something that makes her feel whole and human again. For the first time in forever, Thea Queen is making the world a better place and she feels like herself while doing it. My vote? Thea Queen for mayor please and thank you. This season of Arrow is shaping up to be a lot different than the other seasons but in the best way possible. New faces will introduce our characters to unique challenges and opportunities for character growth and development. I'm hopeful that this is just the beginning for all of that. I liked this episode a lot more than the premiere, and I'm loving the integration of the new recruits so far, too. Also there has been quite a stir made in the Arrow fandom recently regarding Oliver and Felicity's relationship and some interviews conducted. But honestly? This kind of Oliver/Felicity episode is one that I want and one that I enjoyed. Felicity spoke truth into Oliver — with love. It wasn't necessarily romantic love (in the sense of "they're about to jump one another in the lair because of the UST"), but it was deep, genuine love that cannot be easily buried. And Oliver eventually listened to Felicity and realized she was right. Hopefully Oliver's character development will help set him back on a path toward reconciliation with Felicity; as long as complete and utter transparency and trust are the foundational elements of their new working relationship, it can be the foundation of their new romantic relationship — whenever that may occur. "You don't listen very well." "You sound like my ex." "It's really hot... I mean not!" "Awwww, it's cute you think I can be replaced." Out in the field, meanwhile, Diggle is getting framed for a crime that dirty soldiers committed. It has something to do with nuclear... stuff. And Genesis? All I know is that I zoned out during it but was totally there for Diggle's scruff. In this week's flashbacks, Oliver did some more Bratva stuff. People died. That's about it. Oh, right: HE DID THE SAME EXERCISE WITH THE RECRUITS THAT THE BRATVA DID WITH HIM. Maybe don't do an exercise that, the last time you did it, ended with all of the participants BUT you dead. Just a thought. "It cannot be a coincidence." "Not in this city." I like that Oliver was so intense about training and the team being prepared for the field because Laurel was inexperienced while in the field. "I find myself agreeing with the scary weird guy." Does the new Baby Black Canary remind anyone else of Hailee Steinfeld a bit? "They're too green." "Some could say the same about you." HAHAHAHAHAHAHA. Oliver's quick change during the clinic event was so unbelievable. TOO QUICK, GUYS. "We don't trust you." "That's on you." "No, that's on YOU." I have never wanted to high five a character more than I did in that moment, I swear. "Awww, and people say he's just a pretty face." I like where this is going... but I´m so going to say it in a low voice just in case. Every new character has everything nice, even the "black arrow" and Church (though they will never be Ras). I start to see the logic of Felicity having yet another boyfriend ( I don´t understand why female characters can´t be single for a time) and I actually like Malone (Billy Malone? really?). I agree with you completely when you say this is Oliver going back to the Oliver we first met, and this can be very good, or very bad if they make the same mistakes they did before... it will be quite repetitive. Also love the chemistry between Thea and Lance... much more natural than Lance and Donna relationship, it was kind of forced for me. Thea can become sort of a daughter to Quentin. It´s nice to read you again! !